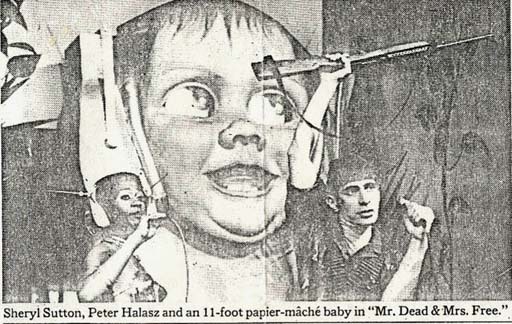 A makeshift curtain slides open to reveal an enormous papier-mache sculpture of an infant, a sort of perfect Gerber's baby on mega­vitamins. What makes the image so grotesque and startling is not simply the baby's size (12 feet by 3 feet), but its accessories. This is no dewy-eyed innocent cuddling a teddy bear, but an ecstatic hedonist with ears encased in stereo headphones and its eyes re­placed by television screens. This acoustically-stoned infant (created by company member Eva Buchmuller), is the central image in "Mr. Dead and Mrs. Free," an award­winning theater piece created by Squat, the collective appellation for a group of expatriate theater artists from Budapest who have been living and working in New York since 1977. Through the first week of December, Squat is presenting - for two weeks each - revivals of three of its three best-known productions, "Pig, Child, Fire!" "Andy Warhol's Last Love" and "Mr. Dead and Mrs. Free." Judging simply from the powerful visual images that dominate its pieces, one might conclude - not in­correctly - that Squat belongs to that venerable theatrical tradition. which attempts to transcend the limitations of realism by fashioning works that are larger than life, boldly stylized and unabashedly theatrical. But Squat's productions defy the restric­tions of realistic theater in another, considerably more subtle way that distmguishes its work from that of other artists - say Robert Wilson or The Bread and Puppet Theater - who also create large, startling visual images. We might say that Squat avoids conventional "realism," not only by creating defiantly unrealistic images, but also by letting the "real world" - rather than a "realistic" representation of it - become a part of its productions. Squat performs in a converted storefront theater on West 23d Street, a block east of Eighth Avenue. At strategic moments in each of the three productions a black curtain is drawn open to reveal a large window and glass door facing the street. By peri­odically enlarging the audience's theatrical frame of reference to in­clude the outside world, Squat man­ages to incorporate the random, un­predictable ebb and flow of street life into its productions. The unrehearsed reality of the street can thus be juxta­posed against - and contrasted with - highly stylized images like the infant of "Mr. Dead and Mrs. Free." Passers-by of all descriptions in­variably begin to peek inside, some­times pressing their faces up against the glass for a better look. One's first temptation is to laugh at those unsus­pecting souls who have unwittingly wandered into a performance. But it soon becomes apparent that the pay­ing audience is as much on display as those random spectators are. It may sound as if this peepshow de­vice is nothing more than the avant­garde's answer to "Candid Camera." But Squat is not content to keep the "real world" safely at bay - segre­gated from the fictional world of the theater by a glass partition. Not long after the street becomes visible to the audience in "Mr. Dead and Mrs. Free," a jeep comes screeching to a halt outside the window and a group of soldiers bearing a bloodied comrade comes storming into the theater through the glass door. With a grim ef­ficiency-that is quite terrifying, they stride confidently into place, estab­lishing a sort of beachhead. An even more remarkable moment occurs when the jeep returns to the street, blending into the real traffic and disappearing into the night. This fascination with voyeurism and with the relationshjp of art and life is very much a product of Squat's history. Most of those who comprise the present company first began working together in Budapest in 1969. Following the premiere of their play "Skanzen Killers",the company was accused by the Hungarian censors of obscenity and of creating work that was likely to be "misinterpreted from a political point of view." As a result of these charges they were prohibited from performing in public. But Stephan Balint, a member of the company, insists that thi authori­ties' uneasiness had little or nothing to do with the group's politics or lack thereof. "It was really the fact that we wer totally independent, without any official sponsorship or connection," suggests Mr. Balint. Eager to con­tinue working together, the group began to perform privately for invited audiences in the home of company members Anna Koos and Peter Halasz. Miss Koos suggests that many of the group's present preoccupations were spawned by the experience of playing in their living space. In 1973 the company performed without official permission at a thea­ter festival in Wroclaw, Poland. Upon returning to Hungary, several com­pany members found their passports confiscated. The group's continuing troubles with the Hungarian Govern­ment came to a head in 1976 when ­after much bureaucratic wrangling - ­they were finally granted permission to emigrate. After an itinerant year of performing in Holland, England and France,they decided to call themselves Squat, at the suggestion of a friend who noticed that they always tried to occupy the empty spaces that no one else had discovered. In 1977, Squat theater settled in New York. Both esthetically and financially Squat functions as a true collective. Program credits for its productions invariably read "Written, Produced, and Directed by Squat Theater." Fur­thermore, the 23d Street Theater also serves as the troupe's home. Unlike the Messianic collectives of the 60's,however, the members of Squat don't advertise their communal status or view themselves as a model or micro­cosm for a new and more enlightened society. "The way we live and work," says Mr. Balint, "is a result of our hitory. It's a practical economic neces­sity. We are not in any sense ideological." Squat's real achievement is to have found a solution to one of the contem­porary theater's most vexing dilem­mas, the fear that modern life is itself more dramatic and theatrical - certainly more dangerous - than any­thing one might experience in the theater. The problem then becomes how to infuse the theatrical experi­ence with some of this energy and excitement (or conversely, how to pre­vent the theater from becoming a pro­tective shell that buffers and softens the intensity of life). The members of Squat often liken their procedures to those of the classical Greek tehatre. Inappropriate as this comparison may at first seem, it does nevertheless remind us that the Greek theatre was an open-air theater, and that the larger world beyond the stage was always visible to the spectator. Antonin Artaud, whose famous letter to Andre Breton is read aloud in "Pig! Child! Fire!," insisted that "the theater must make itself the equal of life." Many of the theater groups that Artaud influenced during the 1960's assumed that the way to realize this goal was to try and replace the comforting artifices of the theater with the threatening unpredictability of real life. But the members of Squat, by contrast, are wise enough to realize that one without the other does not produce the desired effect. Only when juxtaposed against carefully pre­planned and controlled artifice does unrehearsed life feel so compelling. Pirandello was probably the first theater person to articulate this dilemma. In plays like "Six Characters in Search of an Author" and "Tonight We Improvise," he asks us to believe that the repeatable, pre-planned arti­fice of the theater has been inter­rupted and shattered by spontaneous, uncontrolled' events. But the person­ages who appear to disrupt the orderly proceedings of Pirandello's plays are clearly actors whose actions are just as controlled and pre-planned as the fictional sequences they pretend to disrupt. Certainly, the idea of tension between life and form is vividly,lucidly dramatized, but the actual tension - with its special aura of ambiguity and danger - is never really embodied. And as the members of Squat have learned from experience, it is dangerous to relinquish control - even partially - in this way. For example, in "Pig, Child, Fire!" there is a scene in which two identically dressed actors stand for a long period of time with guns aimed at each other. One night the actors were arrested and hand­cuffed by a suspicious policeman who happened to be passing by. On another occasion, someone passing the theater mistook a fictional shooting for a real one and called the police, who entered the theater- with guns drawn-look­ing for a wounded person. Random risky encounter of this sort play an essential role in all three of the productions Squat is currently reviving. "Pig, Child, Fire!" runs through Oct. 24, "Andy Warhol's Last Love" between Oct. 31 and Nov. 14,"Mr. Dead and Mrs. Free" between Nov. 23 and Dec. 4. This two-month retrospective will provide audiences with an invaluable opportunity to experience some of the most adventurous theatre created anywhere during the last 10 years. Roger Copeland teaches at Oberlin College and is co-editor of the anthol­ogy, "What Is Dance," to be published soon by Oxford University Press.